The flavor fight ends here. 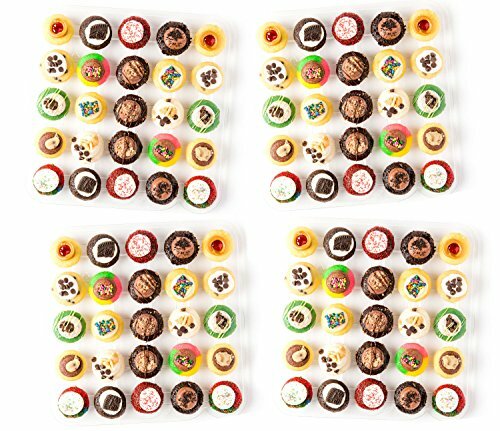 A 100 bite-size cupcake sampler of every handcrafted flavor on the current Baked by Melissa menu. Includes most-loved originals like vanilla Tie-Dye and Triple Chocolate Fudge, the ever-changing delicious Mini of the Month, and the newest seasonal flavors. Perfect for sharing at your next celebration - no assembly required, with a flavor to please everyone on your guest list! Contains 100 bite-size cupcakes. All Baked by Melissa goods are packaged and shipped to guarantee freshness. Bite-size treats are first hand-placed into custom-designed packs and shrink-wrapped to keep them fluffy and fresh. They are then stacked in a freezer bag with frozen gel packs and carefully placed in boxes to be delivered straight to your door! Our mindful packaging process ensures that your cupcakes will arrive fresh and beautiful anywhere in the U.S. - guaranteed! *All of our products are made in a bakery that processes peanuts and tree nuts. If you have any questions about this product by Baked by Melissa, contact us by completing and submitting the form below. If you are looking for a specif part number, please include it with your message.